It’s weird to like something that the artist seems to have mixed feelings about. 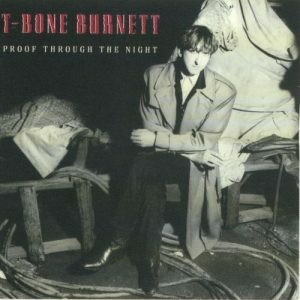 Really, I can’t imagine how I ended up with a copy of T-Bone Burnett’s Proof Through the Night while in college. It’s not like I had a lot of spare cash (or any), so my entertainment choices were generally driven by what seemed like sure things. So, what possessed me to buy it? I must have gotten a deal. It worked out, however. I know that I played the album over and over again. I latched on to something about the songs. Then, the great change came when the record albums went away and were replaced by compact discs. (Let’s not talk about the digital cloud. It hurts to think about what might be next.) Favorite records made the transition as time and funds allowed. But Proof Through the Night eluded me. I had a list of about five old recordings that I wanted back in more current formats. This one was the most challenging. Finally, I found it on a discussion board about re-issues from Rhino records. I was a couple years too late to order it from Rhino and their re-issue was selling for serious cash. How could this be? Well, the artist had apparently been dissatisfied with the record and was going to re-issue the album, but done the way that he wanted. I was a little unclear on what changes that entailed, but other fans of the original appeared to be rending their clothes. This is a strange luxury. We count ourselves lucky to have one version of Beowulf transcribed from the oral tradition within a few centuries of the tale’s origin. We are talking about something only a thousand years ago. Let’s not get started on which version of Shakespeare we have or who edited the plays for printing. We have a strange relationship with those things created by other people that we like. The artist’s canonical works are treated like a baseball fan treats statistics. They are sacrosanct and revealing of something or other. For the artist, the dicey proposition is releasing any work into the wild. Given the opportunity, they would fuss with it forever. Painters show up at galleries to do a little retouching. Writers benefit from new editions that allow them just a few edits. Music can hardly be performed the exact same way twice. Stage works are revived and updated to make them speak to the modern audience, even if only a couple decades have passed. But I like the record that I liked all those years ago. It’s a time capsule for me and for Burnett, but apparently I’m the happy one on that score. I hope that he has made his peace with a few of us listening to the way it was back in the day. You’ve Got to Check This Out is a blog series about music, words, and all sorts of artistic matters. It started with an explanation. 92 more to go.